Satun (Thai: สตูล, [sā.tūːn]; Malay: Setul) is one of the southern provinces (changwat) of Thailand. Neighboring provinces are (from north clockwise) Trang, Phatthalung, and Songkhla. To the south it borders Perlis of Malaysia. The name Satun is a Thai version of its original Malay name, Setul (santol, or wild mangosteen tree). The province is on the Malay Peninsula, on the shore of the Andaman Sea. It is separated from Songkhla Province by the Nakhon Si Thammarat mountain range, and from Malaysia by the Sankalakhiri mountains. The Ko Tarutao and Ko Phetra marine national parks are part of the province. Close to the border with Malaysia is the Thale Ban National Park, a big freshwater swamp area. Until 1813 Satun was a district of the Malay state of Kedah, then known as Setul Mambang Segara or Mukim Setul (Jawi: مقيم ستول) in Malay. After that date it was administered by a governor sent from Nakhon Si Thammarat. In 1897 Satun became part of Monthon Saiburi (now Kedah), which in 1909 was divided between British Empire and Siam as part of Anglo-Siamese Treaty of 1909. While most of Kedah was ceded to Britain, Satun was awarded to Siam because it had a relatively large Thai population. Satun was then incorporated into Monthon Phuket. The monthon system was ended in 1933, and Satun province became a first-level subdivision of Thailand. Satun is one of the four provinces of Thailand which have a Muslim majority: 67.8 percent are Muslim and 31.9 percent are Buddhists. Most of the Muslims have some ethnic-Malay ancestry, though only 9.9 percent of the population claims to be ethnically Malay. The Malay dialect used in Satun is distinctly different from Patani Malay and is much closer to the Kedah dialect of Malay, with a significant admixture of Thai influences. Since Satun had belonged to the Kedah Sultanate, which had a strong relationship for many centuries with both Ayutthaya and Siam under the Chakri dynasty, its Malay Muslims commonly intermarry with Thai Buddhists without serious religious hesitation. This custom has created a distinct social group known as samsam, meaning a mixed person. Most samsams, if not all, are Muslims. Unlike the other Muslim majority provinces in Thailand, Satun does not have a history of political confrontation with the central power in Bangkok or of tension with the Buddhist population which makes up the majority of Thailand as a country. Malay Muslims in Satun are substantially assimilated and rarely sympathise with separatism from Thailand, in contrast to the Malay Muslims in Pattani, Narathiwat, and Yala. The provincial seal shows Pra Samut Thewaa sitting on a rock in the sea, with the sunset behind. Pra Samut Thewaa is a spirit who guards the sea. The rock is his divine vehicle. The sunset symbolizes the Andaman Sea, which lies to the west of the province. The provincial tree is the Thai Rosewood or Pha-yungklaep (Dalbergia bariensis), and the provincial flower is the Snowy Orchid Tree (Bauhinia acuminata). The province's motto is Peaceful, clean, and pure nature. 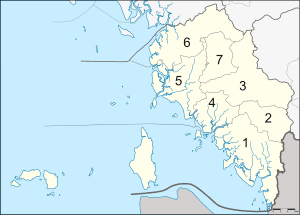 Satun is divided into seven districts (amphoe). These are further subdivided into 36 sub-districts (tambon) and 277 villages (muban). Satun itself is the only town (thesaban mueang), there are a further five townships (thesaban tambon). The non-municipal area is administered by 35 tambon administrative organizations (TAO). Originally, the province was divided into two districts, Mambang and Thung Wa, and the minor district (king amphoe) La-ngu. Due to the decline of pepper production in Thung Wa District, in 1930 the government made Thung Wa a minor district and instead declared La-ngu a district. In 1939 Mambang was renamed to Mueang Satun. Khuan Kalong was split off from Mueang district in 1969, from which in turn Tha Pae was split in 1976 and Manang in 1996. In 1973 Thung Wa regained district status. Khuan Don was established in 1975 by splitting it from Mueang district. According to a Satun Provincial Office spokesman, the province's tourism income rose from two to 6.3 billion baht from 2010 to 2013, while tourist arrivals increased from 690,000 to 1.13 million. Satun Central Mosque or Mambang Mosque (มัสยิดกลางจังหวัดสตูลหรือมัสยิดมำบัง) The mosque has modern style architecture. Its white building is decorated with glazed tiles, marble, and glass. Satun National Museum – Kuden Mansion / Istana Tengku Kudin of Kedah (พิพิธภัณฑสถานแห่งชาติสตูล – คฤหาสน์กูเด็น) During 1997–2000, the Fine Arts Department rebuilt the Kuden Mansion into a Western two-storey brick building. Its Thai-styled hip-roof is covered with Spanish terra cotta roof tiles. The top of the pediment is adorned with a star-shaped vent in accordance with Islamic architecture. Wat Chanathip Chaloem (วัดชนาธิปเฉลิม) The first Buddhist temple in the town of Satun. It is a Thai-styled two-storey building. The first storey is a brick building used as a preaching hall. The second storey is a wooden building for religious practice by Buddhist monks. Laem Tanyong Po and Hat Sai Yao (แหลมตันหยงโปและหาดทรายยาว) A cape jutting into the Andaman Sea where there is a fishing village. Its long sandy beach is fringed with coconut trees and fisher's houses. Tarutao National Park (อุทยานแห่งชาติตะรุเตา) The first marine national park of Thailand. The area was declared a national park on 19 April 1974, and an ASEAN Heritage Park and Reserve by UNESCO in 1982. Ko Khai (เกาะไข่) An island to the west of Ko Tarutao. This small island is between Ko Tarutao and Ko Adang. The famous feature of Ko Khai is its natural stone arch, the symbol of the Tarutao National Park. Coral reefs are found in the sea around Ko Khai. Muko Adang – Rawi (หมู่เกาะอาดัง – ราวี) Islands 40 km to the southwest of Ko Tarutao, or 60 km from the town of Satun. 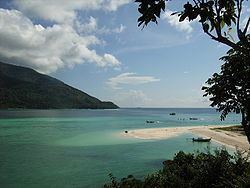 Ko Adang (เกาะอาดัง) The island has an area of around 30 km2, with many beaches of fine sand. It is surrounded by small islands, and is popular for diving. Ko Rawi (เกาะราวี) This island has an area of about 29 km2. Ko Lipeh or Ko Lipe (เกาะสิเป๊ะหรือเกาะหลีเป๊ะ) There is a community of Moken (Chao Le or Andaman Sea Gypsies) here. Most families earn a living by fishing. Most importantly, the villagers will build boats from Rakam wood and perform a ceremony to float the boat, according to their belief in the prediction of their fishing. 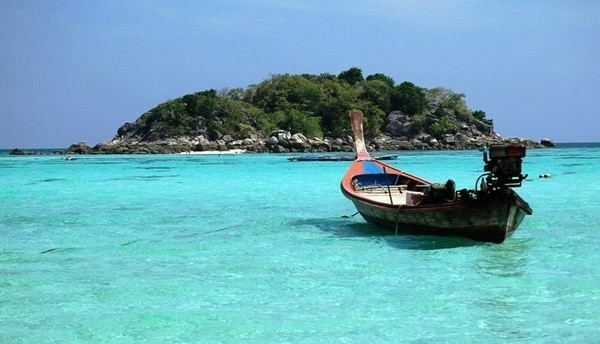 Ko Lipe is becoming a major tourist destination with many bungalow complexes on the two main beaches, Pattaya and Sunrise. Ko Hin Ngam (เกาะหินงาม) A small island to the southwest of Ko Adang. On the beach, there are smooth black stones in different shapes and with beautiful patterns. Ko Chabang (เกาะจาบัง) A small island. Deep down around the submerged rocks is the habitat of soft corals, sea anemones, and schools of colourful fish. Muko Dong (หมู่เกาะดง) Islands on the farthest outer ring of Muko Adang – Rawi, around one hour from Ko Adang. There are coral reefs in both shallow and deep sea. Around Ko Dong are 4 – 5 satellite islands. One of them is Ko Hin Son, which prominently looks like superimposed rocks. Tham Lot Puyu (ถ้ำลอดปูยู) Khlong Tha Chin or Tha Chin Canal flows through the cave. Mangrove forests flank the canal throughout its course. Inside the cave, there are stalactites and stalagmites. Bueng Thale Ban (บึงทะเลบัน) A freshwater lake in the middle of a valley flanked by the Chin and the Wang Pra Ranges. Namtok Ya Roi (น้ำตกยาโรย) Waterfall originating from a source in the Hua Kraming Forest. Namtok Ton Plio (น้ำตกโตนปลิว) Waterfall originating from Mount Chin. This large and beautiful multi-tiered waterfall flows from a high cliff. Thai – Malaysian Border Zone or Wang Prachan Checkpoint (เขตชายแดนไทย – มาเลเซียหรือด่านวังประจัน). It is just 2 km from the park's headquarters. Located here is the Thale Ban National Park Ranger Station. Namtok Thara Sawan Forest Park (วนอุทยานน้ำตกธาราสวรรค์) The area was declared a forest park by the Royal Forest Department on 23 July 1996. Regular rain causes an abundant evergreen forest here. Namtok Panan (น้ำตกปาหนัน) In Tambon Thung Nui, 39 km from the town of Satun. The waterfall originates from Mount Kaming. The surrounding nature is still intact. It has water flowing all year round. A power generating dam of a medium scale has been built in the waterfall area. La-ngu Local Museum (พิพิธภัณฑ์พื้นบ้านละงู) The museum building has 2 storeys. On the ground floor, there are local handicrafts and sweets for sale. A museum on the upper floor displays brassware, earthenware, silverware, etc., which are the private collection of Mr. Chaiwat Saikun. Ao Nun (อ่าวนุ่น) A bay where the park headquarters is located. Hat Rawai (หาดราไว) The beach is fringed with lines of pine trees. Ko Lidi Lek (เกาะลิดีเล็ก) The Ranger Station is here. A white sandy beach lies on the island. A mangrove forest grows at the island's side where various aquatic animals inhabit. Ko Bulon (เกาะบุโหลน) There are scattered spots for snorkelling and scuba diving, such as Ko Ayam and Ko Hin Khao. At night, hermit crabs and ghost crabs can be seen on the beach. Namtok Wang Sai Thong (น้ำตกวังสายทอง) The beauty of this waterfall is the limestone in the shape of multi-petalled lotus flowers settling on the bottom of the pools at each of its tiers. Namtok Than Plio (น้ำตกธารปลิว) It originates from Mount Lung Khroe in the provincial areas of Satun and Trang. This two-tiered waterfall has a pool 40 m wide and 50 m long at its base. The surrounding area is shady with various plants. 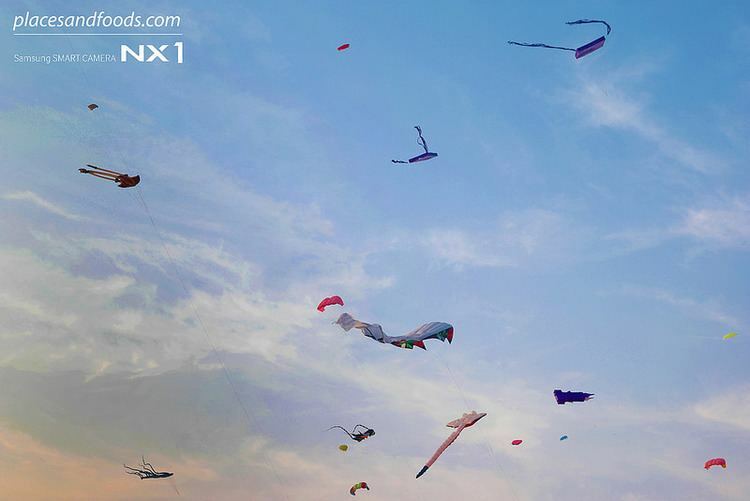 International Kite Festival Held every year around February at the Satun Airport, around 4 kilometres (2.5 mi) from the town of Satun. Tarutao – Adang Fishing Club Fair Held every year around March. Satun Marine Tourism Festival Held around December to mark the start of the marine tourism season in Satun. Boat Floating Tradition Observed by Chao Le or sea dwellers at Ko Lipe in Satun around the middle of the sixth and eleventh lunar months of every year. It is intended to dispel bad luck, as well as to call on spirits for bountiful fishing. There has several TV and radio stations can be received in Satun from Thailand and Malaysia.